Note from Elad: Making your own costumes is always a big challenge and lots of fun. We’re always hoping that the ideas on our site will inspire you, but you must be careful! I’d like to thank Tony H. from Millom, England for taking the time to send in this letter and photos. I’ve placed it in a prominent place on our site to remind everyone to use your best judgment and take all the necessary precautions when setting out to create your own homemade costumes. The photos below may be a bit extreme for some, but I’ve decided to post them here anyway as a reminder to us all of what could happen if you’re not careful. I would like to make people aware of the risks of these homemade costumes which are HIGHLY FLAMABLE! 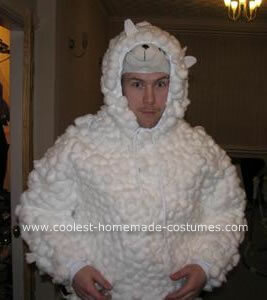 We got the idea for a sheep costume made from entirely cotton wool and went to work on a white hoody and trousers. After around 10 bags of cotton wool and several tubes of fabric glue the masterpiece above was created. All was going well and the costume well received until I went to light a cigarette and accidentally set fire to the hood that was pulled up around my face. The fire spread and I was lucky enough to be rescued by 2 friends who were also outside otherwise I would have not been able to free myself from the flaming clothes. I was lucky enough to only burn my inner thighs, hands and chin – 2 degree burns to 6% of my body. After a week in hospital and small infection in my leg I am now back home and on the road to recovery. Have a fire retardant base layer on. Cut the sides and then velcro up the costume so it can be easily ripped off in the event of a fire. I took none of the above precautions and have paid the consequences – don’t think that this couldn’t happen to you, be safe not sorry! my pal had the same mistake, good thing I was watering the plants. This is a good sign for you to quit smoking ~ how people suffer to support the tabacco companies. Hmmmm… do love the costume though! Glad your OK.
Just have to add that people want to use NON-flammable materials. Inflammable actually means the same as flammable, i.e., inflammable stuff BURNS. Don’t ask me why they mean the same thing…they just do. Use NON-flammable materials, that’s the ticket. I have seen many people die for burns. Hats off to this company for taking the lead in making sure we all are safe. Thank God your alright!!! But you didn’t need to hear how you should quit smoking. It was a great costume!!! I always make my own costumes too, I think thats the best part. I had a friend who had this same story only he didn’t turn out so well. His girlfriend went as Bo-Peep and he went as a sheep. They were in a bar when someone decided he would try to light one of the cotton balls to see what would happen. Well, as in the story his entire costume went up in flames and he was air lifted to a hospital 6 hours away. He had 2nd and 3rd degree burns to most of his body. Thankfully he recovered but will never be the same. It was a cute idea but ending up badly. Please be safe with your homemade costumes and be around people that you trust. This is a warning about the hazards of an unsafe Halloween costume not a debate on why he should stop smoking. Lighten up people. Personally I am thankful he is okay and was brave enough to post this to possibly save others (or their children) from experiencing what he went through. I don’t think they are going to add a “May cause your Halloween costume to go up in flames” warning to cigarette packs any time soon. This was a freak accident that, like most, could have been avoided. But it could just have easily have started with a candle or a tiki torch. We have a campfire at our yearly Halloween party that is coming up soon. Thanks for this message. This will cause me to keep an eye open for party goers who may not have considered fire safety when constructing their own costumes. And dude, don’t let anyone make you feel stupid. We all make decisions every day that could have negative consequences that we might not have considered. We just usually end up on luckier, less unlikely end of them. My sympathies to you. Thanks for warning others of your incident (glad you’re ok! ), and thanks to the website for posting the warning. Considering the flammability of a homemade costumes is probably not on the minds of most who are looking to create a costume! To those who are using this as a forum to impose your views of smoking– get a grip, get a life, go read a book or something. The point of the letter/pictures is to watch out for how flammable materials in homemade costumes can be. Being a smoker didn’t make the costume more flammable than the friend of the other reader who had his costume ignited by some jackass at a bar. Not all fires/burns start from cigarettes, either. Haven’t you ever seen the home videos of weddings or birthday parties where someone/something goes up in flames after being near a candle or some other spark?! Thanks again to the writer of the letter to warn us all about the dangers in making a homemade Halloween costume, and the website for posting it. Never use a material that you are not familiar with, you may be in trouble if you use and have a reaction. wow me and mom have always made our own costumes and we didn’t even think about stuff like that happening scary well thanks for telling us that!! Thanks for sharing your pain. I make costumes every year for myself and my family and I never even once gave fire safety a thought. You just changed that! Thanks! Tomorrow I’m buying a whole roll of Velcro! Thanks for writing this letter. I am so glad you are ok! I hope that you did NOT give it a thought that you deserved this because you smoked. I am not a smoker, but I don’t think this happen because you are. This could have happened to anyone in any situation near flames. Thanks again!!! Do not try to remove your clothes. Roll around on the floor to put it out! Less than a week ago three lads on a stag do in Portsmouth (UK) wearing homemade sheep outfits like this one. Two men out drinking decided it would be funny to set fire to one of the lads and all three were badly burned when the fire spread to the others outfits. Unfortunately there are lots of idiots like that around and I’m very glad you are warning others of flammable costumes. 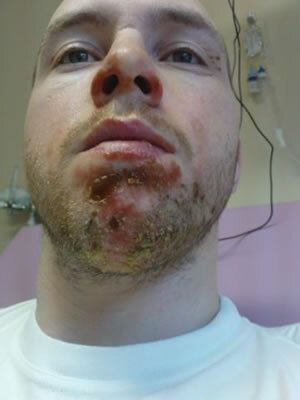 Secondly, it’s a real shame that this happened and hope you get better soon. Thirdly, I think it’s absolutely outrageous that people are leaving comments to repremand you for smoking?! As said above, it was a freak accident that could’ve happened to anybody and caused by a whole variety of things. I’d just like everyone to think if they dressed their child up as a sheep for a party and got set alight by cake candles or something? Would it be their own fault for liking cake? I think not. Don’t let anyone make you feel stupid. That costume was awesome! I would have thought it would just singe the cotton and melt it a bit and not engulf in flames. So many burn accidents can be avoided by learning from mistakes like this and the quick thinking of others. I THANK YOU for your courage to share your story even though you probably have a few “friends” that think it was a big joke. Please, if you ever see someone in need don’t just wait around for others to save them. Think fast, push them in the pool, take off your jacket and cover them. Get involved. A woman and her child were burned to death in a nearby city because she was paralyzed with fear and passerby’s were unable to open her car doors. They stood by as the car was overtaken with flames and both the mother and child died. If it were me I would have picked up ANYTHING to smash that window. Remove the child first and then the woman. I hope you have the courage to do what is right when the time comes. I believe it is our duty. Thank you young man for your valuable lesson! In that way you are yourself a hero. My family will be a little bit more careful and safer because of it. I read through all the comments, and first off, I want to say thank you for sharing this story with us. I know it never crossed my mind (and the minds of the other people who commented) that Halloween Costumes could catch on fire very easily! Thank you for sharing your horrible experience to us so we can all avoid experiences such as yours. I’m very glad you lived to tell the tale. And as for the smoking thing, yes, we all know that smoking is bad and you should quit, but that’s not the point of the story, people! The point of the story is that ANYTHING can catch Halloween costumes on fire…whether it be cigarettes, candles on a cake, tea lights inside a Jack-O-Lantern, or like somebody said, some idiots at a bar who think it’s funny to light somebody on fire! but that is one hell of a way to get a black sheep costume! That’s scary stuff! I made my kids costumes last year out of tulle and cardboard and paint. Walking torches I guess. I’ll rethink my supply list for this year. Thanks for the safety reminder! That looks painful. Thank you for sharing, I will be extra careful. You would never think something so innocent and fun could be turned into a tragedy. Pictures are worth a thousand words. Glad to see you are using the experience to educate the rest of us. We all get so involved in the excitement that we forget about common sense. Thanks for reminding me. I will be remembering your story when making our costumes this year. Best of luck to you!!! ****Suggestion that perhaps this warning could be moved to the home page of this site where it would be seen by all. Or at least have it highlighted so that it draws more attention, everyone should take the time to see your story. Smoking is not the issue but safety certainly is, how many candles are kids around on Halloween? My kids are in there costumes for days on end between the school party, trunk or treat at church, festivals, costume contest, friend parties, door to door and giving out the treats from home. As kids, we used to get dressed up only on Halloween but it seems like now we celebrate all week long since everyone host things on different days. Every community can’t decided if they want to host things the weekend before or after the 31st. So much going on that it drags out all week :) It just shows how many times they could be at risk. THANKS AGAIN for the wake-up call. We will be thinking of you, not of your accident but remembering you for your courage to open up about your experience so that others can learn from it. The whole point is Safety. Always be cautious. You may not smoke but a person beside you might or there could be a candle lit nearby. In the end Why isn’t as important as the fact as it did or could happen. I have taken the warning labels for Halloween costumes for granted until NOW. Thank you for opening my eyes with the SERIOUSNESS behind COSTUME SAFETY! I believe in sharing learned events to help promote awareness, thank you for sharing yours. Tony: Thank you. That took guts. Your compassion probably saved lives. TAKE RESPONSIBILITY! 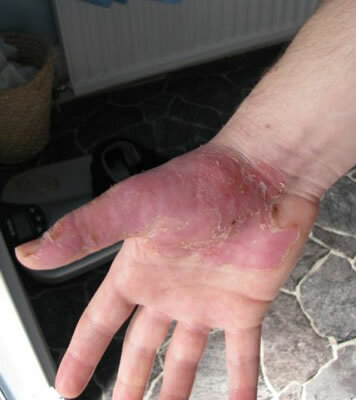 If you use a flame retardant, check before AND after treatment! Inflammable means flammable? What a country! Thank god you’re okay. I’m 13 yrs old and i make my costume practically every year. i love Halloween. two years ago i went as a table with a very long drapey table cloth. i really should have made my costume narrower because some jack-o-laterns nearly made me catch on fire quiet a few times. luckily i had two good friends watching out for me and keeping the fabric away from flames. my costume was also very easy to take off, i would just throw it off my head. Thanks for the tip dude, after reading that, i just i think for the first time in ever, thought of flammability of the materials i wear, and for the costume im gonna construct. Took alota courage and guts to post that stuff, especially with those trying to redirect this towards its your fault because of smoking, when its clearly just a mistake that coulda happened to anyone (smoking, not smoking)< i know if it was me, i probably woulda caught on fire immediately seeing as the partys i go tend to have bon fires, and since im a fire fly i tend to hang around em. So yeah, most definitely looking into fire retardant materials for my costume. Thanks so much for sharing. I’m working on a flower costume right now for my DD and I’m re-thinking the petals all the way around the face; just a headband would be easier to get off in an emergency. I love the Velcro idea too. You really made me stop and think, and I’m sure you have averted possible tragedies with this info. Thanks! Aww your sheep looked good, man! All that hard work for a bunch of burns! I’m so sorry that happened to you, but I’m glad you’re okay! Better luck next time! This was a good wake up call..Thanks for posting! Thanks for reminding me about the warning of flammable stuff. Now I know not to use anything flammable. Get off your soap boxes and stop with the “shouldn’t smoke” crap. This is strictly a safety issue warning people of costume safety. As stated earlier, it could have been ANY open flame that did this. Outdoor fireplace, fire pit, bbq, tiki candle, idiots with lighters, fireworks…etc. There are wonderful ideas out there for very unique costumes. I applaud those with the great imaginations to come up with halloween stuff we can all “borrow” later on. We just need to be cautious of how things are made. Glad this gentleman is ok and here’s hoping it will be a safe halloween for everyone this year. This has happened to a dear friend of mine when he was trick-or-treating. He had walked past a jack-o-latern and it caught his cape on fire. No one had anything to put out the flames so he was rushed to the hospital. He now has scars all down is back and legs so be very careful. 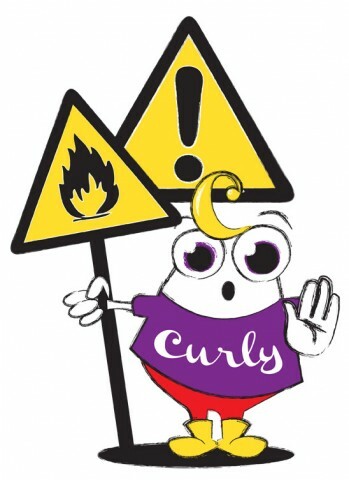 making your own clothes flame retardant… i’ll test it first and post. sorry about your luck. but i say smoke’m if you got them. I knew someone that almost caught fire too. No, it wasn’t from smoking, but from the decorative candles set out on the food table at the halloween party. He was the Scarecrow from the Wizard of Oz, and just like in the movie, the straw caught fire!!! Luckily, Dorothy was nearby to throw some water on!!! Watch out for any loose material, or using material that may be more flammable than you’d think! It is definitely good safety tips on the costume making! However, any costume is to me considered a fire hazard’ pretty much all material is flammable! My children are having home made costumes this year and one could be more flammable than the other! However, they are supervised with me, not around fire etc! Adult costumes and the mishaps that do occur, are surely from a night of partying and a little in toxicity, that can really makes the costume hazardous!! Wow! What a hard way to learn a such a lesson. I am glad you are doing well! Thank you so much for sharing your story so that others can learn from it. No one, smoker or not, should have to endure the pain that you did. I will definitely think twice about the materials I make my kids costumes with (and my own). My daughter was a princess with long flowing sleeves and she almost caught on fire reaching for something over a candle. Smoking, roasting marshmallows, reaching over a candle… be careful. your comment about “time to quit” was in poor taste This gentlemen went through something that was VERY traumatic and I for one was grateful that he took the time to warn us I would never have thought about those things. Frankly I am grateful that he is/was a smoker and that because of that someone else will not make the same mistake. wow – Thanks for sharing your story. As an extremely safety conscious person and ex-smoker – I must say, I never would have thought about the hazards of smoking in the sheep outfit. I am so glad your friends reacted well and prevented a worse outcome. I am going to a house party with a person who looooovvves candles. I will be thinking about safety when designing my costume. I hope you are all healed or well on the road to recovery. This exact thing happened last night at a party I was at. Her costume was almost identical and it was a cigarette… but it could of been any flame. She went up instantly and it seemed to take forever before a guy burnt his hand getting it off her. She has second degree burns to her neck and arms and lost a lot of hair. Her best friend is traumatized that he accidentally fell on her with his cigarette. I agree, not a place for a no-smoking lecture. At Halloween and other holidays candles are always around and also pose a great risk, and nothing to say that a person next to you at a party isn’t smoking. I will show these pics to my 8 year old daughter. A picture is worth a thousand words. Thanks for sharing your story. It definitely reinforces safety precautions, especially when we are making costumes for our children. Hope you are recovered well & take good care! It was great of you to post this. I hope that you have healed well and that this hasn’t discouraged you from being creative with this year’s costume. To the person that posted a comment “it’s time to quit smoking”–you missed the point. How ignorant of you. He would have had the same result if he, walked a little too close to a tiki torch, or a barbecue pit perhaps. Sometimes, especially when we are hanging out with friends, get distracted and are more relaxed, we forget about common sense. This could have happened to anyone! Smoker or not. Hello people get off your soap boxes! He is very lucky and doesn’t need the lecture from you! There could have been any number of hazards he encountered on that night, for example a jack o lantern with a real candle in it! Your comments don’t help anyone quit smoking. When they are ready, they will quit! To all of the rest of you, have a very Happy and safe Halloween! P.S Don’t forget the reflective tape on your children’s clothing so that they can be spotted more easily on the streets. I got this tip from KomoTV last night. Put them together in kitchen sink and you good to go without having to figure out where and how to dispose the leftover mixture, just flush them out. The one on Ehow suggests you to spray the fabric. This one is easier, you just have to dip the fabric and then let it dry naturally. Also you should not smoke. It causes cancer and lung diseases. But i am glad your OK.
Thank’s for the warning and thank you for the fire retardant mix.. I was trying to put the scorch marks on Freddie Kruger’s hat, we had cut bits out of an Australian 100% wool Acubra, took ages to even get a scorch mark and setting it on fire would have been near impossible, so woolen fabrics and wool felts are a pretty safe product to incorporate into costumes. Yes, the irony of it is that sheep’s wool is naturally fire-resistant. But the cotton used to mimic this naturally fire-resistant “sheep’s clothing”, as described above, is some of the best fire tinder available. Cotton is a dried plant fiber. So as far as how it will react to a spark or flame, think of finely divided straw or newspaper. About the same, only better for flame starter because the surface area of cotton fibers is much much higher. On TV, Less Stroud in an episode of “Survivor Man” actually plucks a bit of cotton off his socks while camping in the Altimaha River valley to use as an excellent fire starter because it takes a spark so well. And on the flip side, in the analytical laboratory in which I work, the heat resistant mits we use to remove red hot crucibles from ovens are made of..yes, you guessed it…wool. So Jack be nimble, jack be quick, but unless your sheep’s clothing is from an actual sheep, don’t try to jump over the candle stick! Oh my goodness! You poor thing. Thank heaven you are alright and thank you for sharing this story. I agree with a number of comments above and want to call them out- again suggesting a prominent place on this site for this discussion. There is more here than fire safety. Reflective tape on costumes for children. There is an increase in drunk driving on Halloween like any other holiday. Anything to make kids visible is great. Watch out for capes and things that hang. You can trip, get stepped on and fall, or catch fire. Make sure you can see well and turn your head, especially if your out on the street. Know your materials. Most fabrics in the US are flame-retardant but be sure to check when you buy it. If it’s not made to be worn, think twice. And then think of how you can get in and out of it. Because we wear these things once we do things like attaching a back zip dress with staples to a front-opening collar across the zipper top. In an emergency you couldn’t rip it off. Take the extra minute and keep everyone safe. First, so very glad you are okay after all and thankful you took the time to warn us. Just feeling very lucky about my many years of enthusiastic costuming. Second, very great costumes are often cumbersome as well as dangerous. I once created a fat lady beauty queen out of polyfill, pillows and queen-size pantyhose — completely oblivious as to the dangers of pretending obesity. But great fun can be had with simple designs, especially for kids and drunks (I have been both of these, at one time or another, and now have them (kids, and groan-up — ones), too. My favorite example of this is the clumsy ballerina (traditional costume with blacked out teeth). Third, can we quit talking about quitting? I mean hassling others about it and hassling them about their hassling. My dad had three different cancers and was a reformed smoker with a lot of guilt about it — lived mostly as a purest. My granddad was a coal miner who started smoking when he went to work at age 14 and lived to 89, mostly very healthy and with very few regrets (Coincidence?) Kept smoking til the end, as long as he could wander far enough away from those !%*# oxygen tanks. Point is, everyone has their own path. My life is not exactly in perfect order and I’m sitting here writing this nonsense. Cool smoker dude with the very groovy sheep costume spent his time well, notified us, and we all profit. Thanks! Finally, my sweetheart had sever burns last year — had nothing to do with costumes or flames or smoking — freak accidents deserve sympathy and groovy sheep dude has mine… I don’t mind if your smoke, do you mind if I rant? Be sure to use inflammable materials, huh? Well, sorry to correct you, but inflammable means it CAN catch on fire! Flammable and inflammable mean the same thing. Don’t ask me why we need two words for things that can catch on fire, but that’s how it is. To all those attacking him for smoking… thats a really horrible dig, its like saying he deserved it because he was smoking. What if he had just walked past someone smoking and got set alight? Would that make it ok?? End of the day the message is safety for homemade costumes.. not stopping smoking. Great cossy, bad result, but glad you turned out ok, lessons have been learned by your unfortunate accident, and we will all be more safety conscious thanks to your post, also I’d jut like to say, all you ‘Born Again’ Non-Smokers, Quit Now! you’re getting as bad as those religious freaks, I no longer smoke but I don’t ram it down peoples throats, this is NOT the Smoking Quitline Forum, this poor guy went through that ordeal and all you can say is ‘stop smoking’!? btw here’s some hay to feed your high horses. Those look so painful! I hope you quickly recover and i hope you recover strongly. that was a amzing costume, and its not your fault it was caught on fire. alot of people smoke, and just because you did, doesnt make it you fault. thank you for pointing out there risks, and thank you for giving us all the precautions we should take. i hope you recover quickly, and i hope you have a happy Halloween next year. Thanks so much for bringing that to light! hope you had a full recovery! to the individual who doesn’t believe in smoking. i sure you it exists, and there are people who do it. my cousin has a lung disease called cystic fiberosis and we both HATE to see people wasting the lungs god had given them and she (who has never even TOUCHED a cigarette has horrible lungs that she was born with and didn’t have a choice to have them so please please please stop ruining gods gift to you- any ways im glad you’re okay btw love the costume idea and I used to LOVE making my own costumes!!! hope your burns feel better!! My father has made a werewolf costume for years that involves gluing cotton balls all over his face and arms, combing it and spray painting it. It is really awesome looking but HOW DANGEROUS!! I am going to pass this information along to others. I have 13 children – we do A LOT of homemade costumes and this information could likely have saved a life!! THANK YOU!! THANK YOU!! THANK YOU!! Nobody should smoke on Halloween when kids can breathe the nasty fumes!!!!!!! It is difficult to find flame retardant fabrics anymore. Chemically processed fabrics especially for babies sleepwear is not available. So follow the other precautions. Stay ample distance away from bonfires. Cotton wool is extremely flammable! (as you discovered obviously)& unfortnate that it’s the natural choice for sheep costumes. Any material can catch fire but I’d say avoid cotton wool! We went on a survival course & were shown many ways to light a fire without matches & ALL methods used cotton wool as the initial kindling as it lights so easiy from the tiniest spark! Esp if puffed up as contains lots of air. It should be kept away from batteries & wire wool as well as the obvious open flames. Thanks for warning & hope you are not scarred for life! I’m glad you had friends there! I made a similar costume two years ago for my infant, I’m glad no fires were near her! I made it because I didn’t have the money to buy her a costume, it didn’t occur to me that she was flammable! I wonder if polyester balls instead of cotton would still go up in flames and use airplane glue instead. Thank you for sharing your horrifying experience with others. I was definitely much more aware of candles around my son this year with his bulky homemade costume. At one house there were lighted tiki torches along the walkway! I also made sure I designed his costume so he could easily be pulled out of it. Thank YOU so much for the warning! It’s something I would have never imagined. I wish you the best. A friend of mine got her eye burned because she´s short and some tall careless idiot was holding his cigarettes carelessly. Accidents happen all the time. Another friend lit a stove and left the tea towel just right to it, consequently the thing went up in flames. If you are so stupid as to smoke in bed or while wearing flammable clothes, well, maybe you should be entered for the Darwin Awards. My sister knows this guy who went to went to a fancy dress party with his mate as a cloud. As everyone was drinking his mate who had had a bit to drink joked with his lighter lighting their costumes on fire,both mens cotton wool master pieces went up in flames!One guy jumped in the pool so his burns were not as bad,but his mate got severe burns to 90 percent of his body and nearly died. Be careful everyone,this was soo sad. Love from AUSTRALIA. Come on folks. Doodoo happens. Personal responsibility and reasonable precautions. We’ve found ourselve in an obsessively over protective society. As long as you’re not strapping steaks to your body and walking into the lion pen at the zoo…lighten up and carry on. Doodoo happens and always will. This is clearly not the costumes fault! I want to be completely honest. If this man hadn’t been a smoker, this wouldn’t have happened. Smoking can take your life away in many scary forms. Don’t let it happen to you. Time to QUIT! All you preachy anti-smokers – stop going on at the poor man. You’re missing the point of this post. I’m trying to make a TF cosplay! My friends at the cosplay forum i’m a part of should see this! Thanks!! I’ll Give ’em a heads up! Thank you for caring to share your story for those who might be just as careless without having heard your story. I hope you are doing better now. Thaks again.